In a small saute pan over medium-high heat, add the pecans. Toss the pecans in the pan to evenly toast, about 5-7 minutes, remove from heat and then add the butter. Stir the butter to coat the pecans evenly while the butter melts season with salt and pepper and set aside. In a medium bowl, add the cream cheese, mayonnaise, cheddar cheese, and cayenne pepper. Mix well with a fork until fully combined and set aside. In a medium bowl, add the celery, olive oil, salt, and pepper and toss evenly to coat. Place on grill pan and cook until charred and slightly tender with some crunch, about 2 minutes on each side. Remove to a plate and top (TK spoon on top or use piping bag) with cheese mixture. 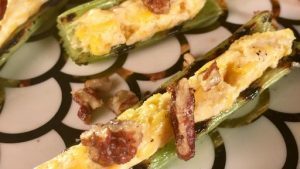 Top the cheese-filled celery with a generous amount of pecans. Tip: If you have any leftover filling, spread it between 2 slices of bread, and fry in a saute pan for a grilled cheese that packs a punch!